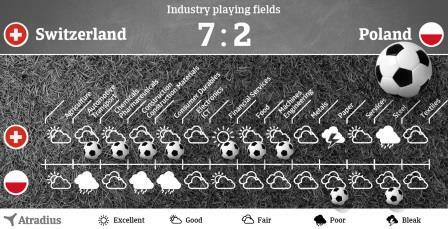 The Industry Playing Fields provide a visual performance forecast for 14 different industries in countries paired together in the Euro 2016 tournament. With the European football championship 2016 advancing into the Round of 16 and quickly moving towards the finals, we have produced Industry Playing Fields comparisons. These visual match-ups will analyse the industries performance forecast for countries which are paired together in the actual football tournament. Atradius will provide a score for the match-ups, ranking the outlook for each sector as Bleak, Poor, Fair, Good, Excellent. The country with the better industry outlook compared to its opponent scores a goal, symbolised here by a football. The Industry Playing Fields are available in the following languages: English and German, Dutch, French, Italian, Spanish, Polish, Hungarian and Czech on our local websites. German non-food retailers struggle to cope with the fast growing market leaders, while the rebound for their Italian peers remains modest.